After Vijay’s 57th film Kaththi with AR Murugadoss enjoyed phenomenal success at box office, his next film Puli is already garnering tremendous buzz. The last schedule of Puli commenced today at Narabheli near Thalakonam confirm sources in the trade. Vijay is leaving no stone unturned to ensure that he completes the magnum opus Puli on time, state sources. We hear from credible sources that the Ilayathalapathy has been working without opting for a break even on Sundays. He has been on the sets of Puli for three consecutive Sundays, something that he had never done in his long career. Of course, this shows his extreme dedication. The during this schedule, the talkie portions will be wrapped up completely, add sources. With this particular schedule planned out until April 30th, the team is working day in and day out to meet the deadline. Sources added that Vijay and team will be flying down to Cambodia after this schedule to can a couple of songs. The shooting of this film has been going on at a steady pace for the past few months and has reached the final stages. The fantasy film directed by Chimbu Devan boasts a star studded cast of Vijay, Sridevi, Sudeep, Hansika and Shruti Haasan. While the fist look of Puli was rumoured to be revealed on April 14, fans were left disappointed as the makers kept Vijay’s look under tight wraps. 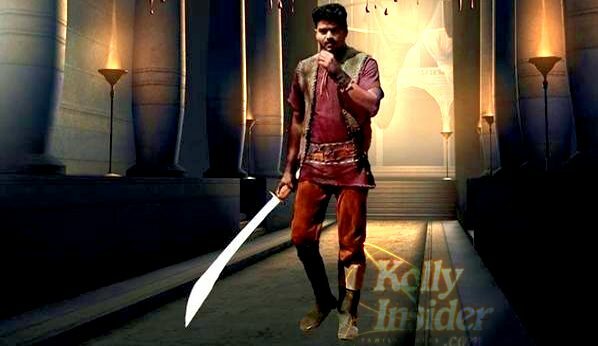 Few days back new picture has made it to the internet, which shows Vijay in warrior avatar. This leaked image is spreading like wild fire across Facebook and Twitter, leaving the Puli crew highly disheartened.